Most children don't need as much food as adults. Use your child's hand as a guide for serving sizes. Give them a palm-size amount of protein food such as meat, chicken, seafood, eggs or legumes (cooked dried beans, split peas or lentils). Give them a fist-size amount of carbohydrate food such as potato, pasta, rice or bread. Give them two cupped handfuls of colourful vegetables. You can also use the healthy plate model as a guide (see the image to the right). You can follow this model even if you are making meals such as stir-fries, casseroles and salads. See the example below for chicken and vegetable stir-fry. See Meal planning and healthy recipes for ideas to help you plan and prepare tasty, fast, easy and low-cost meals. What if my child doesn't like vegetables? Be a good role model. If your child sees you eating and enjoying vegetables they are more likely to do the same. Involve your child. They are more likely to eat vegetables if they have been involved in buying, preparing and cooking them. Serve vegetables like carrot, celery and capsicum (pepper) raw. Keep offering vegetables. Some children will need to try a new food up to 15 times before they like it. 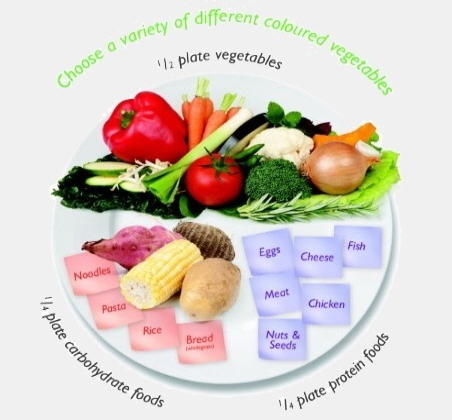 For more tips see Vegetables for children (link downloads a PDF) from Vegetables.co.nz. Making small changes to the way you prepare and cook your meals will be good for the whole family. Add grated or finely diced vegetables to mince dishes or casseroles. This makes the meal healthier and the meat go further. Serve potato boiled, baked or mashed (with a little low-fat milk). Grill, steam, dry bake, casserole, stir-fry or boil instead or frying or roasting in fat or oil. Trim the fat off meat and remove the skin from chicken before cooking. Drain or skim fat off the top of mince, stews, soups and gravies. Limit sausages to once a week. They are very high in fat. Grill or barbecue sausages and prick them first so that the fat can drain away. Use small amounts of lite or reduced-fat coconut milk instead of coconut cream. Desserts such as cake and most types of ice cream are high in fat and sugar. They are best kept as occasional treats. Fruit makes a healthy and tasty dessert. Make fruit kebabs by chopping fresh fruit into cubes and putting it onto skewers. Or cut up lots of different fruit to make a fruit salad or a colourful fruit platter. 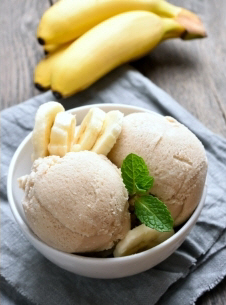 Try the healthy homemade banana ice cream below. Put the frozen bananas into a food processor and blend until the bananas begin to break into small pieces. Continue blending until the bananas become smooth and creamy. Eat straight away or refreeze for later. If freezing for later, take it out of the freezer a few minutes before using so that it softens. Written by HealthInfo clinical advisers. Endorsed by Community Paediatric Dietitian, Nurse Maude. Page created October 2016.